After a quite rainy autumn, the weather turned very favorable and we had a successful burn of our oak woodland on Thursday November 10, 2016. This has been one of the best years for doing fall burns. We burn our North Woods every other year, usually in the fall of the year. The last time we burned it was in 2014, and details of that burn can be found on this post. A successful burn depends on proper fuel, proper weather, and a good crew. We had all these last Thursday. The first time we burned this oak woodland was October 1999, and we have been burning it on a biennial schedule since 2008. The predominant species is red oak, with substantial white oak and a large patch of Hill's oak in one area. Also, scattered bur oak, especially on the upper ridge. The topography is rugged, with about 200 foot vertical drop from the upper ridge to the County highway. We have a good fire break at the top of the ridge, and always start the burn there, moving in two directions and then down the ridge to the highway. This year we extended the burn a little on the west and (especially) on the east, where there is a fine basin with many large white oaks. Parts of this latter basin had probably not been burned in 80 years, if ever. Most of the fuel was oak leaves, which had come down over the past two weeks. Start of the burn of the white oak woodland at the east end of the site. The fire backburned almost all of the way down the hill. Only a small amount of interior lighting was needed here. The weather was quite favorable. A dry air mass had come in, promising clear skies and warm air. When lighting started at 11:30 AM the RH was 43 and the temperature about 60 F, with light wind. These conditions held all afternoon. I did a quick measurement of the rate of fire movement through one of the white oak areas. The rate was about 3 feet per minute, which is the same rate as that given by Patrick Brose of the U.S.F.S. in his publication on burns in oak forests of eastern U.S. The next day Kathie and I did a survey of the burn coverage. Most of the areas that we expected to burn were black. In all, a succesful burn. Although we often have trouble getting satisfactory prairie burns done in the fall of the year, this year has been an exception. The prairie grasses have all cured early and the weather has been cooperating. 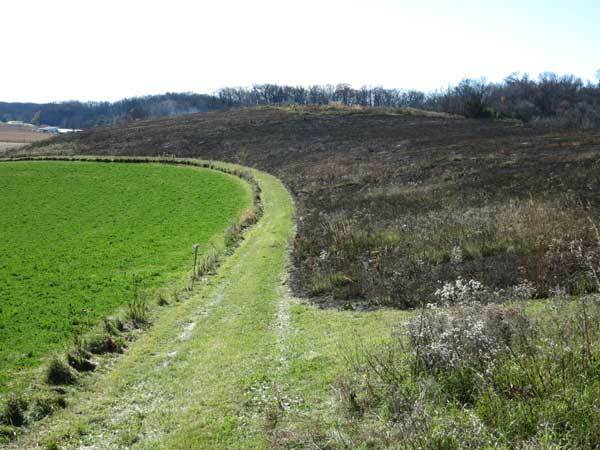 On Monday Dane County Parks burned the prairie remnants at Walking Iron. 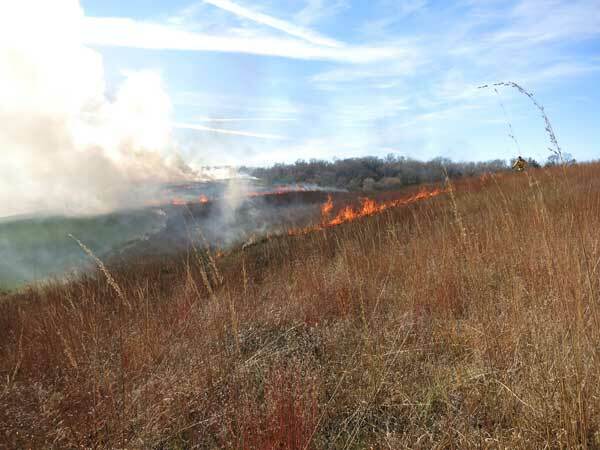 Today Amanda and the folks at Integrated Restorations LLC did the burn at Black Earth Rettenmund Prairie that we generally only do in early spring. What a joy to have that burn already out of the way! We have three burn units at BE Prairie, and burn two of the three each year. The schedule is arranged so that each unit is burned in two consecutive years, followed by an unburned year. 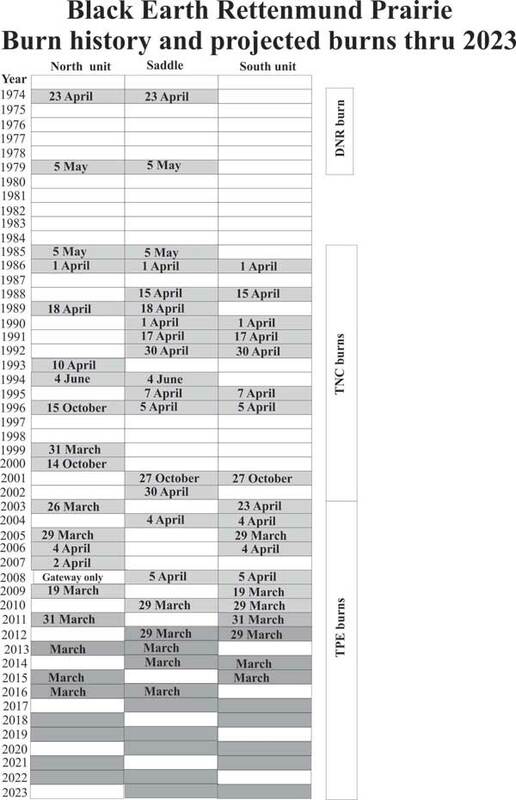 This was the year to burn the South Unit and the Saddle. See the burn history and projected burn schedule through 2023 at the end of this post. Fire line moving across the Saddle. and big and little bluestem), but lots of the forbs burned well also. Sean doing some interior lighting in a patch of cool-season grasses. One reason we wanted to burn in the fall is so that we could spray this patch of cool-season grass early next spring. This patch developed during the major drought we had in the summer of 2012. After the burn. Burn coverage was greater than 90%. The lane here separates the prairie from the neighbor's alfalfa field. This lane is our fire break and means of transportation to the South Unit. One difference between this fall burn and our usual spring burns is smoke. Although the warm-season grasses are fully cured, there are still lots of small green patches, either uncured cool-season grasses, or fall regrowth of spring perennials such as wood betony and prairie violet. These green plants always burn with lots of smoke. Fortunately, the prairie is far enough away from the highway so we did not have to worry about traffic control. 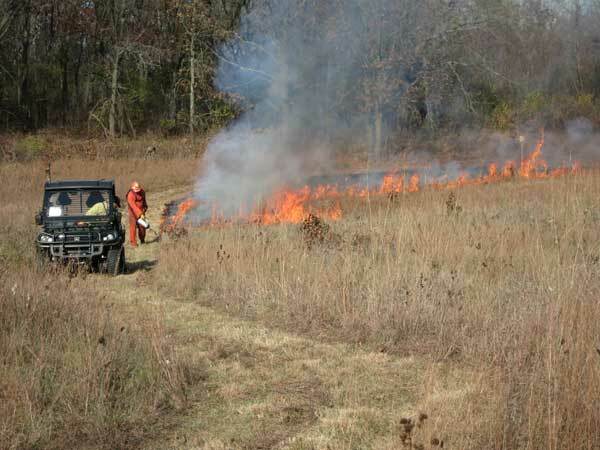 The fall weather this year has provided good conditions for small prairie burns. 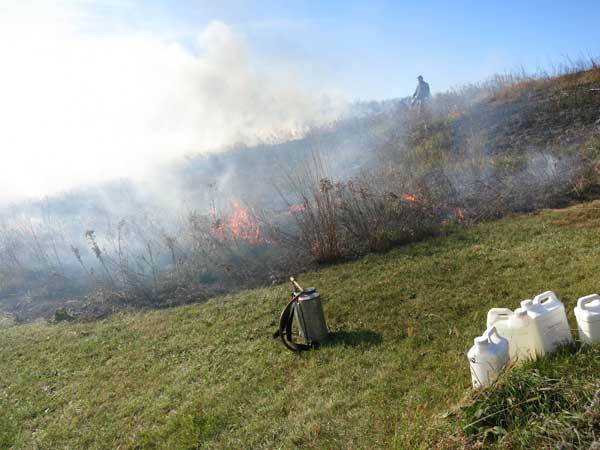 See my post for a general discussion of fall prairie burns. Walking Iron Prairie, part of the Dane County Park System, is an excellent small prairie known for its outstanding displays of pasque flowers in the spring. Also noteworthy is Hill's thistle, prairie smoke, white prairie clover, and Carolina puccoon. At one time the Empire-Sauk chapter of the Prairie Enthusiasts had a web page on Walking Iron, but this got deleted during a modernization activity. Since I wrote this web page, I am taking the liberty of copying the key content at the end of this post. However, this prairie thrives on being burned, and for the past ten years, due to a set of unusual circumstances, burns have mostly been nonexistent. 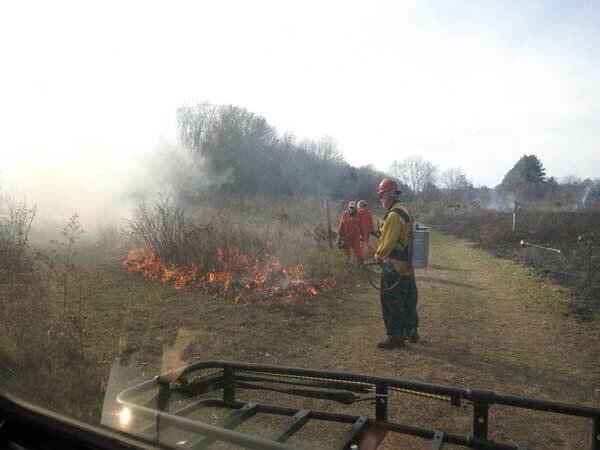 This year a group of dedicated Dane County Parks volunteers led by Denny Connor, came together and, using the highly favorable fall weather, burned the key portions of the site. Wetlining the fire line in preparation for lighting (Denny and Ron). Lots of black oak grubs will be set back by the fire, thus keeping the prairie open. A wide hiking trail goes through the middle of the prairie. The unit on the right has already been burned, and the unit on the left is now being burned. Note the large brush patch burning. Walking Iron County Park is owned by Dane County. 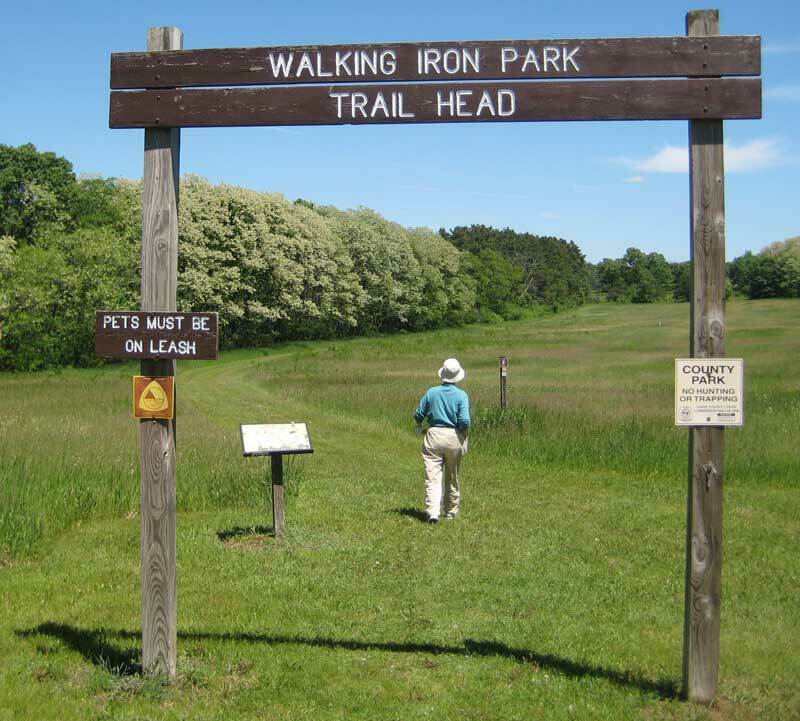 Walking Iron County Park has 288 acres offering miles of hiking and equestrian trails winding through restored prairies and wooded areas. The prairies represent only a small part of this acreage. The Village of Mazomanie was established in the 1850s as an important railroad stop and the term “Walking Iron” derives from a Ho-Chunk word for railroad: “the iron that walks”. There are three entrances, one inside the Village of Mazomanie at 636 Hudson Road, an entrance to horse trails at 645 Segebrecht Road; and the principal entrance at 6064 Beckman Road in the Town of Mazomanie. The entrance to the prairies is the Beckman Road entrance, reached from Hudson Road just west of the village. From Hudson Road turn right onto Beckman Road soon after crossing the Black Earth Creek bridge. The Park entrance is about a mile to the north. Although Walking Iron County Park is in the Driftless Area, it was profoundly influenced by the glacier. The melting of a large ice mass near Middleton caused formation of a major river, which laid down thick sand beaches extending far into Iowa County to the west. Most of the Park is located on sandy uplands that extend north toward present-day Wisconsin River. The prairie here is a remnant of the vast original prairie that extended through the sandy Wisconsin River bottoms west to Spring Green and beyond. Areas that were not prairie were oak savanna or bottomland forest. European settlers commented on the beautiful fields of colorful flowers here. 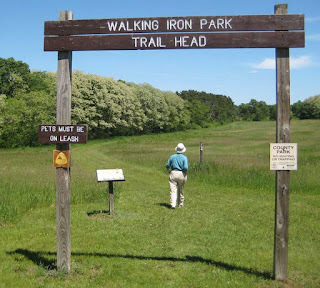 The highlight of Walking Iron Park is Pasque Flower Prairie, a prairie remnant reminiscent of prehistoric times. Prehistorically, the Native Americans used fire to maintain their hunting grounds. After settlement, it was kept open in part by natural wildfires. 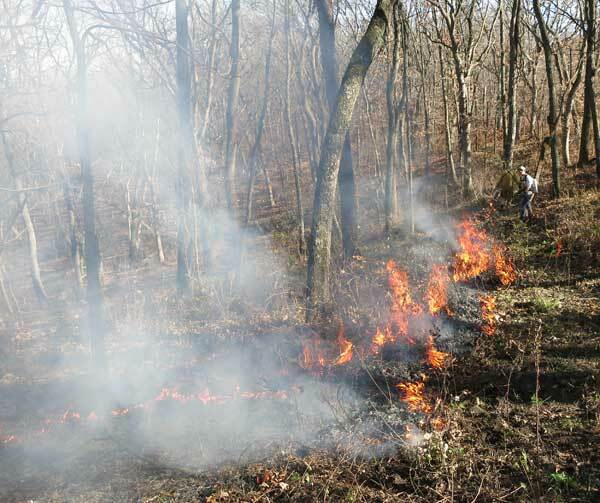 In present times, prescribed fire is managed by Dane County Parks. The best known plant of Pasque Flower Prairie is, of course, the pasque flower (Anemone patens) itself. This is one of the earliest blooming species in the prairie, often appearing very soon after the final snows have melted. Other colorful plants of the spring flora are lupine, prairie smoke, and sand puccoon. Mid-summer flowers include white and purple prairie clover, yellow coneflower, bergamot, and rosin weed. In the late summer the prairie grasses wave in the breeze. Early fall brings goldenrods, asters, and gentians. There is always something blooming in Pasque Flower Prairie. To the east and north of Pasque Flower Prairie is a nice oak savanna, which is being kept open by occasional prescribed burns. Among the oaks are prairie and savanna grasses and a characteristic flora of savanna forbs.